Her outfit is so cute. How cool that you have penguin pictures like that too. I love that exhibit. My favorite part of the Tenn. Aquarium is the Butterfly Pavilion. I could just sit in there all day. My poor little Tricky! What did your mean mommy do to you? You come and live with your godmother. 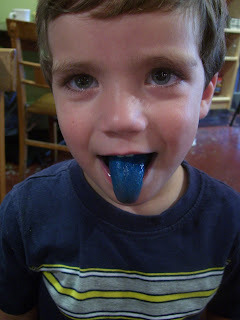 Love the blue tongue and the upset fairy! Thanks for sharing. What great candid shots! Thanks for sharing! Happy WW!